Weight: 2 - 3 pounds. 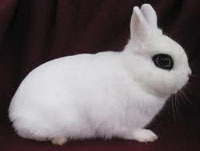 Body Type: These little rabbits have a very striking appearance they are all white except for a ring of clack around the eyes, which makes them look white rabbits with black eyeliner. 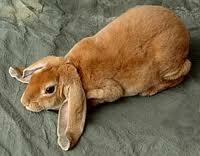 They have compact, rounded bodies and short, upright ears. Weight: 2 1/2 - 4 1/2 pounds. 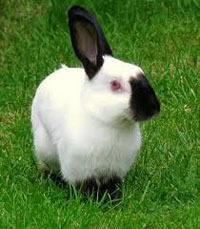 Body Type: White rabbits with ears, nose, feet, and tail colored black, blue, lilac, or chocolate. Body is long and narrow with narrow head and rather short erect ears. Weight: 2 3/4 to four pounds. Body Type: Head is slightly flattened, body is short and looks massive. They have lopped ears and a prominent "crowns" (the ridge of cartilage between the ars). 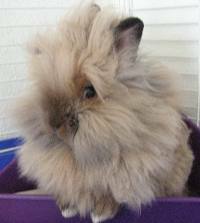 These popular rabits come in many colors and have soft, fine fur. Weight: 2 1/2 to 3 1/2 pounds. 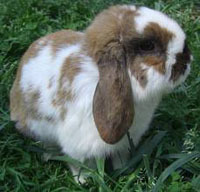 Body Type: This breed was created in the late 1990s by Devie D'Anniballe by mixing the Mini rex, Mini Lop, and Holland Lop. It is not recognize by ARBA at the time of this writing. 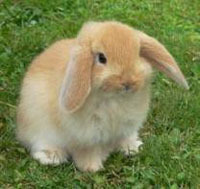 The fur is like that of a rex, the appearance between that of a small Mini Lop and Holland Lop. Good Choice for Pets: Personality usually affectionate. Weight: 2 3/4 to 4 1/2 pounds. 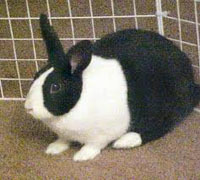 Body Type: The mini rex rabbits has a compact body with narrow shoulders; short, thick, upright ears, and a rex coat. Rex coats have guard hairs which are fine, stright, and no longer than the underhairs, resulting in a plush coat that looks and feels somewhat like velvet. They have been bred in many colors. Weight: 3 - 4 1/2 pounds. 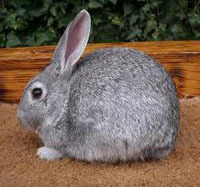 Body Type: Several people in the USA are working to develop a small rabbit with the fur and body of the eight to 10 1/2 pound standard Satin. Weight: 1 3/4 - 2 1/2 pounds. 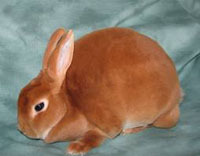 Body Type: These rabbits have compact, rounded bodies, large heads, short necks, and short, erect ears. Fur is glossy and dense and comes in many colors. 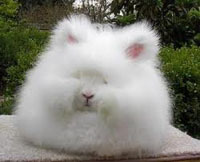 Special Care: Like the Britannia Petite, some rabbit owners claim these are more prone to nip than other rabbits and might be less suitable for children. Weight: 2 - 3 1/2 pounds. 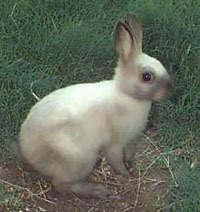 Body Type: Compact body; short thick upright ears. 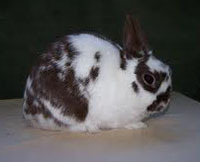 Fur is short and dense and is black, blue, chocolate, white, or broken (color is in splotches on white background). Weight: 3 3/12 - 5 1/2 pounds. Body Type: Compactly built rabbits with well rounded hindquarters. 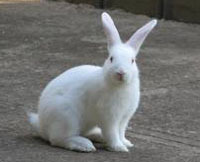 There is a blaze of white on the face, and the front feet, upper torso, and toes to mid-foot of the hind feet are also white. The rest of the body is white, blue, black, chocolate, tortoise, steel or gray. Ears are genetally large and upright. Special Care: This breed usually does well with childern. Weight: 4 - 6 pounds. 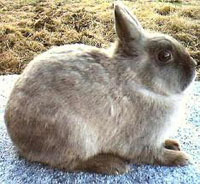 Body Type: Short rounded body, rounded head and short erect ears. They are white with ruby (pink) eyes. Weight: 4 1/2 - 6 1/2 pounds. Body Type: Black, blue or chocolate colored. Body is short with wide shoulders and hind-quarters. Head is narrow, ears medium-long and upright. Weight: 4 1/2 - 6 /12 pounds. Body Type: Body is massive, thick-set, with short neck. 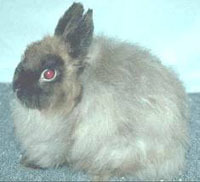 Eas are lopped, and the ears and crown form a horseshoe shape on the top of the head. Fur is thick and dense. Many different colors have been bred. Special Care: A sturdy nrelent for children. Weight: 4 - 7 pounds. 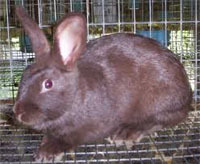 Body Type: Black, brown or fawn rabbits with white thick (silvering). Body relatively long, head narrow, ears long and erect. Weight: 5 - 7 pounds. Body Type: Compact chuby-looking body of medium length. Ears long and upright. Each hair of fur has three bands of different colors; blue at the base, pearl in the middle, and black at the top. Body Type: Belly, chest, flanks, inner part of front and hind legs, trigngle at nape of neck and underside of tail are tan. The rest of the fur is solid black, blue, chocolate, or lilac-colored. Body is narrow and thin, medium long and racy looking. Ears are large and upright. Weight: 5 - 6 1/2 pounds. Body Type: Body is mandolin, shaped, chest is full and rounded. The ears are lopped and measured from 14 inches tip to tip. 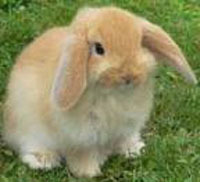 fur is like that of rex rabbits (this breed has been discribed as a minia, true Emglish Lop with rex fur.) It is being bred in seleral colors.